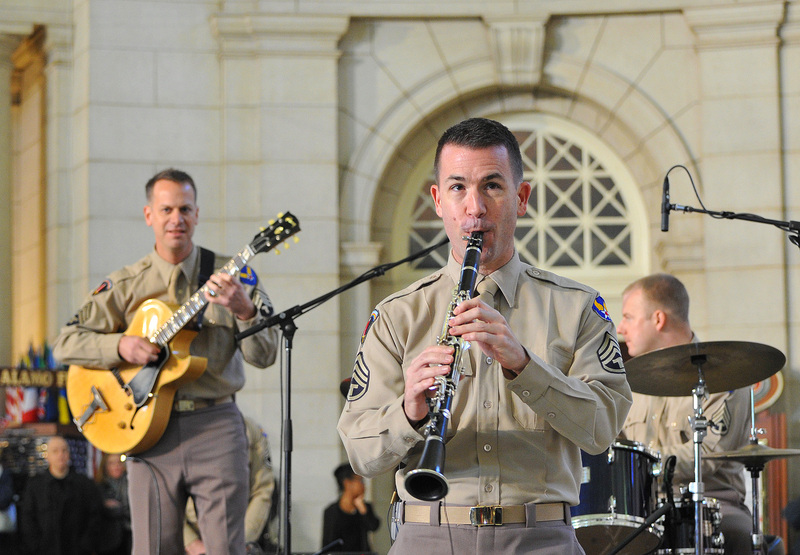 The Air Force Band yesterday staged its annual surprise performance of holiday music at Union Station in Washington DC on Thursday. Unlike previous years, which were more classically-themed flash mob-style performances, this year’s show nodded to the Air Force’s roots and the 70th anniversary of the end of World War II. The musicians wore Army Air Corps uniforms and played a period-appropriate big band-style arrangement of Jingle Bells — even bringing strings into the mix — before segueing to a choral version of Auld Lang Syne. Swing dancers from New York City helped bring everything home, and Air Force Secretary Deborah Lee James showed up to kick things off. Members of the Airmen of Note and Singing Sergeants were among those playing yesterday. This is the third year in a row the band has put on a public show with no advance announcement to start celebrating the holiday season. The first one, in 2013, was held in the original Air and Space Museum in Washington, and last year’s was in the Air and Space Museum’s Udvar-Hazy Center in Northern Virginia, in the shadow of the Space Shuttle Discovery. The videos tend to go viral, with more than 4 million views between the first two.